Notes: Castle is located in Aberdour and is signposted. The attraction has its own dedicated car park. A twelfth century tower house that has been enhanced and expanded over the centuries. Some parts are in a ruined condition. Castle also has a tiered garden complete with dovecote. Castle is owned and managed by Historic Scotland. 1. James Morton, owner of Aberdour Castle during the reign of Mary Queen of Scots introduced the Maiden (a guillotine like device) as a means of conducting executions in Scotland. 2. The same James Morton may have got away with his alleged murder of David Riccio but by 1578 he had been forced out of office by his rivals. He was then charged with High Treason for the murder of Lord Darnley, father of James VI (latter also James I of England) and executed in 1581. His executioners used a Maiden. 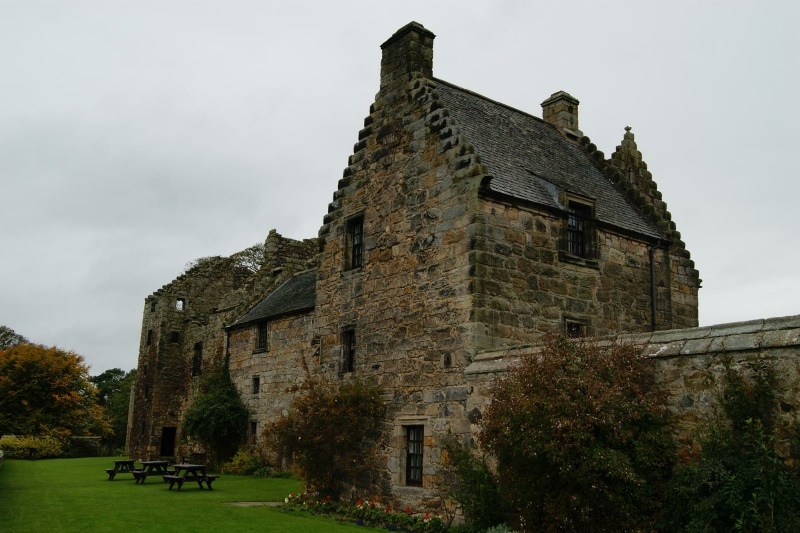 Possibly the oldest surviving masonry castle in Scotland, Aberdour Castle has been a home to the Douglas Clan since the Fourteenth Century. Gutted by fire in the 1720s only part of the fortification was ever repaired leaving the remainder as a picturesque ruin. Aberdour ("mouth of the water") is a natural harbour which, during medieval times, served the Augustinian Abbey at Inchcolm. It was sometime in the twelfth century when the first castle was erected on the site; a rectangular stone keep built by Alan de Mortimer. By 1325 though the castle was in Royal hands and was granted by King Robert I (the Bruce) to his nephew, Thomas Randolph, Earl of Moray. He then granted the castle to the Douglas family in 1342. By the mid-sixteenth century the castle was owned by James Douglas, Earl of Morton, who was Lord Chancellor during the reign of Mary Queen of Scots. However he allegedly participated in the murder of David Riccio, her unpopular Italian Catholic adviser and was required to flee to England. Mary lacked the political authority to seize Aberdour however and James was back in Scotland and in favour again by Christmas 1566. By the seventeenth century the castle was deemed too small to support the lifestyle of the Douglas clan and was upgraded with a new east wing and the garden visible today. This was more pressing by 1642 as the castle had become the main residence of the Earl of Morton as the former family seat at Dalkeith had been sold to support King Charles. In the 1680s the castle was gutted by fire and, aside from the east wing, was never repaired. The Douglas clan ceased using it as a residence in the 1720s and thereafter the east wing was periodically used as a military barracks and then a school room. It was taken into State care in 1924.